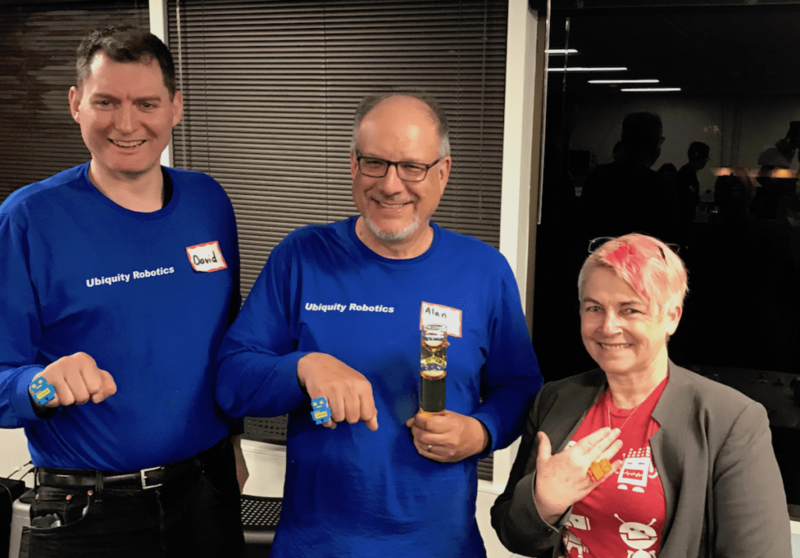 Andra Keay, Marco Ginsburg, Cieanna Smith and Leonard Ginsburg of Production Robotics and Trivia Team iRobot with their 1st place trophies at Silicon Valley Robotics AMAZING Robot Trivia Night. 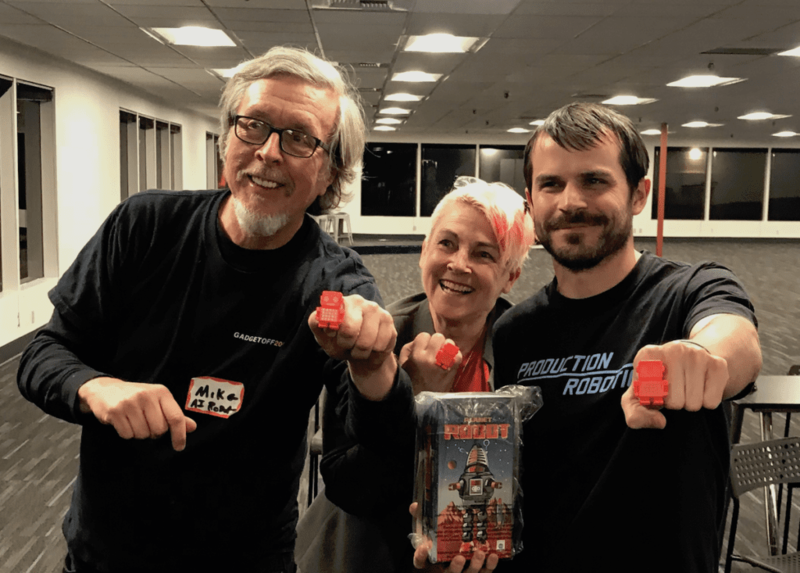 In spite of not being present, Team iRobot won the inaugural Silicon Valley Robotics Amazing Robot Trivia Night on April 11. 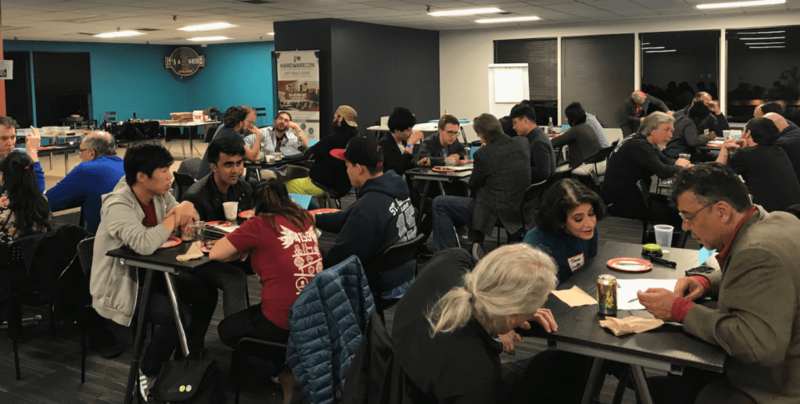 All the tables were named after the attending robotics companies or FIRST teams, and mixed table teams picked a name at random. Team iRobot wasn’t actually from Boston, but a mixture of visitors and our local Production Robotics company. 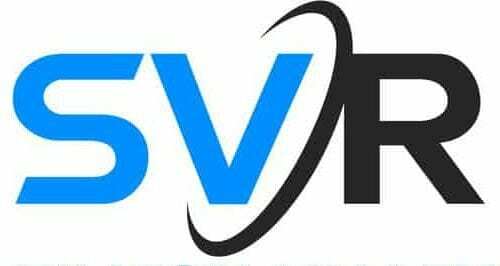 So technically the trophy remains in Silicon Valley, but we think it’s just plain old good karma for iRobot, the iRobot supporters and founders of National Robotics Week! Mike Winter and Justin Gastrich of Team Robot Action League – with photobombing MC Andra Keay. Team Robot Action League won the speed skills and games of chance rounds and took home the second place overall trophy and Robot Championship rings. Not a surprise as many of Team Robot Action League were real life Robot Combat League and BattleBot veterans. Stay posted for a new initiative from Robot Mike called AI or DIE! Team Ubiquity Robotics came in third, followed by Team Panasonic in fourth. 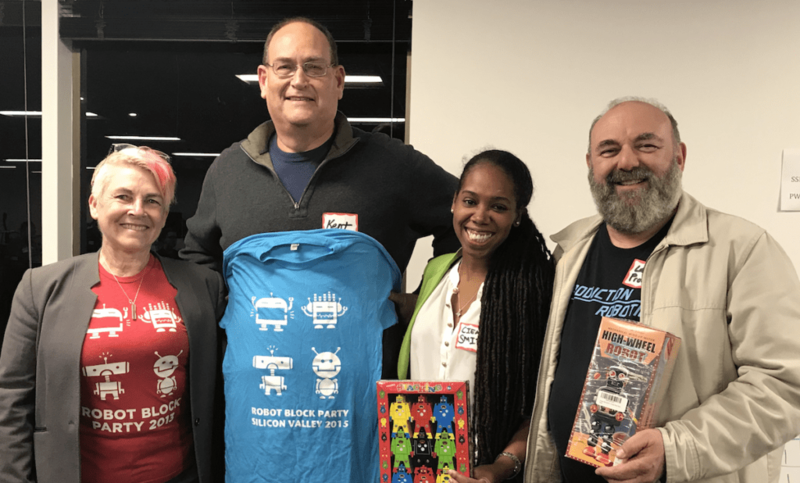 In spite of doing the best in all the robot trivia rounds, and winning bonus points for the robot dance, Team Ubiquity sadly lost the games of chance. However, they wowed us in breaks showcasing their new robot Magni – which runs on ROS, navigates without lidar and can carry payloads of over 100kg. Many thanks to Evan Ackerman (@BotJunkie) from IEEE Spectrum’s Automaton blog and Dr Joanne Pransky, world’s first Robot psychiatrist and ‘real world Susan Calvin’ for their amazing robot trivia questions. We’ve learned that we know WAY more robot trivia than most other people. We promise to make the questions easier next time! 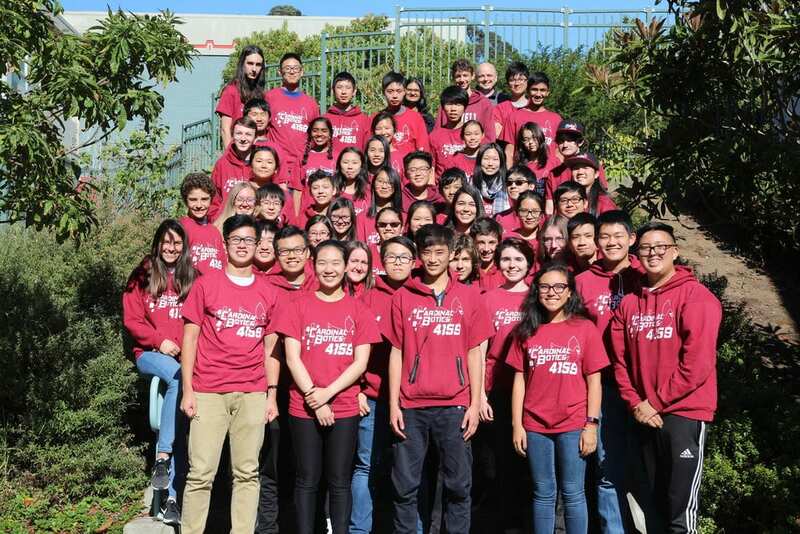 And all the proceeds from our silent auction go to support Lowell High School’s CardinalBotics FIRST Team4159 go to World’s in Houston. We’re still running an online auction to support Team 4159 – BID or BUY or DONATE HERE!